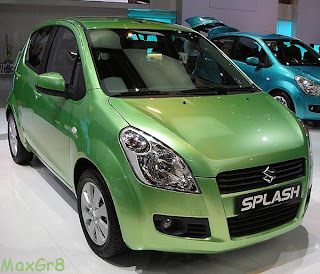 Suzuki Splash is considered as the up coming version of Wagon R, last seen in the auto expo Splash is all set to hit the Indian roads shortly. So, Maruti is looking aggressive towards competition and is doing every possible effort to prevent sales loss. Splash from front looks a bit like elder bro Swift, it is no doubt equally stylish as well. Splash's rear end is very innovative though, atleast for Indian market. The Interiors are quite similar to the swift & and it has good amount of space as well. Talking about Engine & Power Splash would be on sale with a choice of three engines; a three-cylinder 1.0-litre (65 BHP), a 1.2-litre four-cylinder (86 BHP) and a 1.3-litre DDiS turbo-diesel (75 BHP). The more likely specifications would include anti-lock braking system (ABS) and electronic brake-force distribution system (EBD) as standard on all models, while the highly debated and desirable Electronic stability program (ESP) and six airbags (dual front airbags, dual seat-side airbags, dual curtain airbags) will be available on the higher grades or as options. But we need to wait for the variants that Suzuki plans to launch with these features, keeping in mind the price factor.